My journey of discovering sesame oil started long time ago, when I was exploring Asiatic tastes of Chinese kitchen. Then I was fascinated again by it, when I went to an Ayurvedic yoga massage. The masseuse used for the massage a mix of cold-pressed sesame oil and calamus powder from the indian herb Acorus Calamus. This mix is very good for the entire body and spirit, but especially for detoxifying, stimulating the blood circulation and for relaxing the muscles. However, the sesame oil provides a smooth and moisturized skin. After the massage I felt really good and relaxed. Benefits of sesame oil are known for thousands of years. It is mentioned in the Indian Vedas and used as well in the Indian Ayurvedic medicine as an oil with many healing properties. 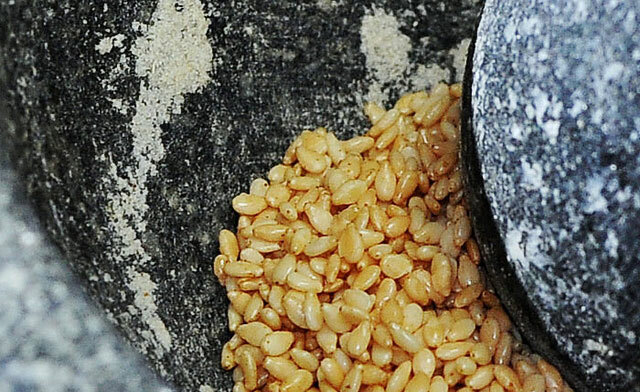 In Asia the sesame oil is an essential ingredient for cooking. The sesame oil is made from sesame seeds. We know at least 2 types of sesame: black sesame (the one sprinkled around the sushi) and the pale yellow sesame, that you find mostly on top of breads and other baked products. There are many varieties of sesame oil, however not everyone is the best for eating and for the skin. The cold-pressed sesame oil is of a pale yellow color and it has preserved a number of good qualities, because it is produced from raw sesame seeds. You can use the cold-pressed sesame oil for inside (in the kitchen) and for outside (for your beauty regimen). Don’t mess the cold-pressed oil with the dark sesame oil, which is not made from black sesame, but it is made from roasted sesame seeds. The dark sesame oil is commonly used for cooking in the East Asian countries and its flavor and beneficial properties are not so praised as those from the cold-pressed oil, because the heat damages all their health-giving polyunsaturated fats. In cosmetics you can use the sesame oil as a basic oil for massage. Try it even on damp skin after the shower or mix it with some organic sugar to get a gentle body scrub. Your skin will be soft and nourished. It can be applied on face skin, too. Sesame oil is especially recommended for protecting the tender baby skin or treating the young problematic skin. As many teenagers wrongly think that oils are not appropriate for their skin, this is not the case for cold-pressed oils. Especially the sesame seed oil helps to control spot eruptions and neutralizes the toxins, developed on the surface of the skin and in the pores, because of its antimicrobial properties. For concluding, there are many legends that narrate stories about sesame seed. There is an Assyrian legend which says that when the gods met to create the earth, they drank the wine made from sesame seeds. According to Hindu legends and beliefs, sesame seed is the symbol of immortality and the sesame oil is considered one of the best oils. It is used even in celebrations, offerings, rituals and prayers. Maybe for our Western rational oriented mind these are just tales, but there is always at least a seed of truth with a deeper meaning in every ancient wisdom, if you open to it. Very informative, I’ve never heard of anyone using sesame oil for skincare. I’d love to try it for spot treatment, and when I get mild eczema around my eyes. Where to get quality sesame oil in the USA? Hi, unfortunately I cannot help you because I’m from EU and I mainly purchase the oil here.